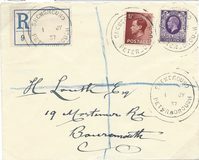 1891 Envelope to Beckenham franked by two 1d Lilac, SG 172, one tied by Bromley/Kent duplex and one by a ROYAL NAVAL EXHIBITION/EDDYSTONE LIGHTHOUSE cachet in Blue. Unusual. 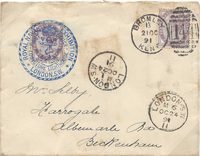 1890 JY 2 Envelope to Earls Court Gardens franked by a 1d Lilac, SG 172, tied by a South Kensington/S.W. duplex with a very fine PENNY POSTAGE JUBILEE cds alongside. 1951 FESTIVAL OF BRITAIN 'SPECIAL BUS SERVICE' 3d ticket. 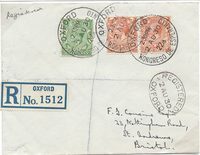 1957 Illustrated envelope for the Inter-Parliamentary Union Conference 1957 franked by a 4d, SG 560, and tied by a "46th PARLIAMENTARY CONFERENCE . LONDON S.W.1 ." cds. 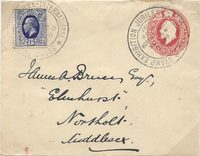 1891 ½d Brown Post Card to Brighton cancelled by a "ROYAL NAVAL/EDDYSTONE datestamp for 19 JU 1891 in Blue. 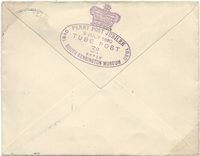 1890 2 July Penny Postage Jubilee 3d "TUBE POST" First Day Cover - addressed to Earls Court Gardens and showing this superb cachet on the reverse. 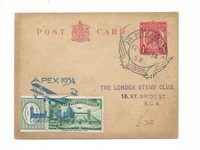 1925 Wembly 1½d Stationry Letter Card to London cancelled by a superb SOUTH EASTERN/T.P.O. 'DOWN' CDS, W 475. 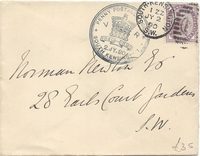 1862 Small Entire addressed to France franked by a 4d PALE RED, SG 80, and tied by a fine INTERNATIONAL EXHIBITION 'IE/W' duplex.